Dr. Morris and the team at Sea Brite Dental are committed to providing high-quality dentistry that prioritizes your comfort and satisfaction. If you have felt uncertain or nervous about visiting the dentist in the past, it’s important to know that it’s not uncommon to have these fears. We’ll help you be able to complete the procedures you need while using oral sedation and a local anesthetic injection. Our patients like to call this the “happy pill” because it melts their fears away, even those who have felt severe anxiety about going to the dentist. It’s similar to Valium but has shorter-acting properties so that you won’t have to worry about being unconscious or having extended effects. You’ll be awake during in your procedure, though you may find that you drift in and out of sleep. That’s a normal reaction and nothing to feel concerned about. 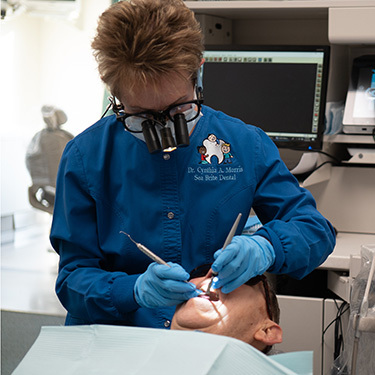 Local anesthetic injections are the most common form of dental sedation available at the dentist. Many people don’t even feel the injection, and it’s over quickly. With this local anesthetic, you’ll be fully conscious during your procedure but unable to feel what is being done in and around the injection site. The effects of a local anesthetic can last for some time. When you leave our office, you’ll want to be careful eating or drinking so that you don’t mistakenly bite your lip or cheek. We find that most of our patients who have felt unsure about dental care in the past do well with our friendly team and full explanations. By detailing what we find and what you can expect from each procedure, you can proceed knowing there are no surprises. If you find that you need further help, however, we’ll be happy to give it to you. Contact us today to schedule your appointment for sedation dentistry La Grande!